With the discovery of gravitational waves, says Kip Thorne, Caltech's Richard P. Feynman Professor of Theoretical Physics, emeritus, "we humans are embarking on a marvelous new quest: the quest to explore the warped side of the universe—objects and phenomena that are made from warped spacetime. Colliding black holes and gravitational waves are our first beautiful examples," says Thorne. 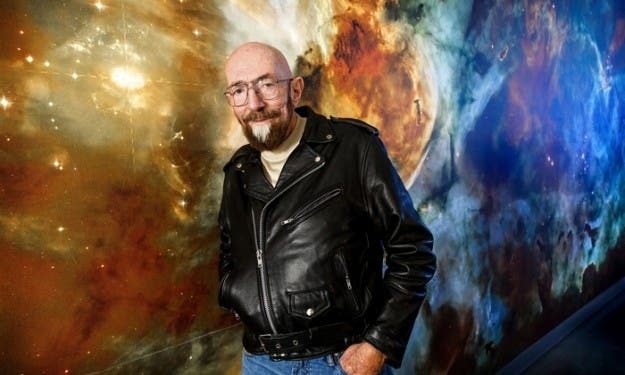 The video below is Kip Thorne's amazing view of this newly revealed dark side of the universe. In June 2009, Thorne resigned his Feynman Professorship (becoming the Feynman Professor of Theoretical Physics, Emeritus) in order to ramp up a new career in writing, movies, and continued scientific research. His most recent major movie project was Interstellar. Thorne was the film's science advisor and an executive producer. His principal current research is an exploration of the nonlinear dynamical behaviors of curved spacetime, using computer simulations and analytical calculations. Thorne is a co-founder (with Weiss and Drever) of the LIGO (Laser Interferometer Gravitational Wave Observatory) Project and he chaired the steering committee that led LIGO in its earliest years (1984–87). The existence of gravitational waves was first demonstrated in the 1970s and 80s by Joseph Taylor, Jr., and colleagues. Taylor and Russell Hulse discovered in 1974 a binary system composed of a pulsar in orbit around a neutron star. Taylor and Joel M. Weisberg in 1982 found that the orbit of the pulsar was slowly shrinking over time because of the release of energy in the form of gravitational waves. For discovering the pulsar and showing that it would make possible this particular gravitational wave measurement, Hulse and Taylor were awarded the Nobel Prize in Physics in 1993.